Guest post from Lisa of . In March of 2011, my family of 6 moved to Panama City, Panama. About 6 weeks later, we received our shipment of household goods. As I was unpacking it, I began to realize how much STUFF we had… and that we had easily lived without it for 6 weeks. Did we really need it all? Those thoughts took a backseat while we got adjusted to our new home. But in October of 2011, I began to clean up the house for my friend who was coming for a visit. Again, I realized we had too much stuff, so I began to purge. Too many bags later, I had gotten rid of almost all of our excess. I realized that we simply had more than we’d ever use, and I did not want more coming in at Christmas. After talking to my husband, the decision was made that we were truly going to give Christmas away. asking anyone who was planning to give any of us a present to please donate the gift or the money to a charity of their choosing. We sat the kids down and explained the situation. After MANY conversations, they understood and got behind the plan. On Christmas morning, they each had one present to open. (What can I say, Grandmas can’t be stopped.) Then, we began talking about all the kids who would be receiving presents in their names. Operation Christmas Child, Salvation Army, local church groups, and more! By the end of the conversation, we were all overwhelmed with the truth of just how much more blessed it is to give than to receive. So much so, that this year, we will be continuing to “give Christmas away”. Have you ever “given Christmas away”? Lisa is a wife and mom of 4 living in Panama City. She blogs at . Even in the most media-careful home, it’s likely that our kids are exposed to the materialistic messages floating around this time of year. In my home our kids don’t watch TV, yet they still know what a Pillow-Pet is! 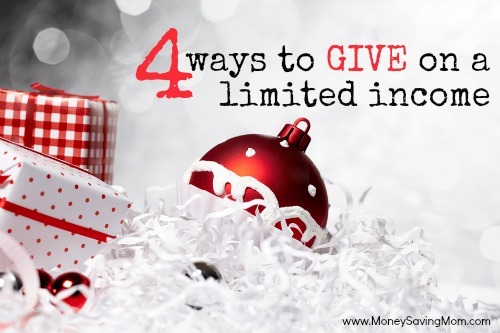 Not only are we challenged to provide a happy, true Spirit-focused Christmas season for them, we are also challenged with helping them learn how to give to others without falling into the “just buy a great gift” trap. I believe that there are a few simple steps we can take to transform our children’s outlook on giving at Christmas… and all year long! 1. Help them write their own Giving List. Our kids can make their own list of family and friends who they’d like to give to. Maybe it’s just Grandparents, parents and siblings. Or, they may want to include a few friends. Helping them see the total number of gifts they’d like to give will instill a ‘big picture’ view for them. 2. 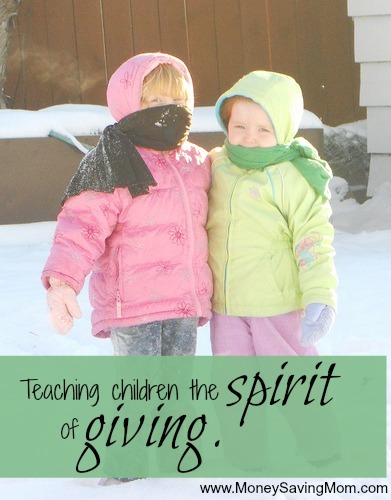 Encourage them to make gifts and recycle their treasures. Re-gifting has gotten a bad name, yet the growing concept of green-gifting is starting to put a different spin on this old no-no. Instead of picking something we don’t like from our own stash, focus on finding ‘hidden’ treasures that our friends/family have spoken about enviously. 3. Help them make out a simple gift-giving budget. Even a 5-year-old can handle a 3-person, $5 each budget. An older child can understand a more complicated prioritized budget, spending more for Mom and Dad, and spending less on friends. Using the envelope system with a name for each person and the money budgeted inside can be a great teaching tool! Talk about what each person on your child’s list likes, or doesn’t like. Start by asking your kids to remember their favorite gifts and what they are hoping to receive this year. “How did you feel when Mommy remembered your favorite color on your birthday?” for instance. Then move into how Grandma will love the photo with a handmade frame from them. Not only will this help our children come up with gift-giving ideas, but it will expand their empathy and deepen their character. 5. Pay attention to how YOU are talking this time of year. It’s so easy to talk about “running out of money”, or to complain about “not getting what we want this year”. Are we paying attention to our own attitudes and how this is teaching our kids to think/feel about Christmas gift giving? Children won’t get a poverty mindset unless we teach it to them. Neither will they develop a healthy perspective unless we consistently model one! 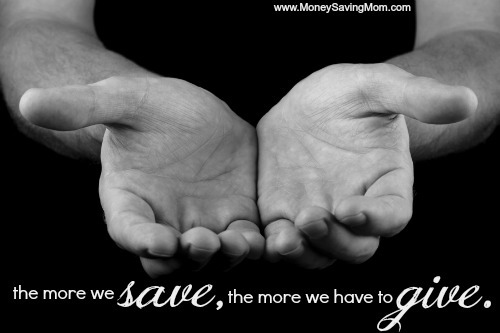 How do you help your children learn to be givers? Elise has served clients and audiences across the United States as the NewLife Recovery Coach, offering common-sense inspiration and transforming truths she’s gathered from over 10+ years of personal recovery. Since the Summer of 2010 Elise has personally dozens of clients through organizing, recovery, and personal challenges. During the holiday season, we are all pulled in so many directions — whether with church, school, or community service groups, sometimes it is hard to determine how to invest our extra time and resources. There is one group of people that none of us should neglect — especially during the holiday season — our military. Being away from the comforts and joys of home can be difficult for a deployed member of our military especially during the holidays. As a wife to an active duty Marine who is currently serving in the Middle East, I can personally say how humbling it is to have people all across the United States praying for, and supporting, my husband and those like him deployed all over the world. There is so much that those of us here at home can do to support the thousands of men and women who sacrifice so much day in, and day out, to protect the freedoms (including the freedom to celebrate our holidays!) we enjoy every moment here in the United States. This is the most inexpensive, yet one of the most appreciated and heartfelt, gifts our servicemen and women overseas can receive. Organizations like accept letters that they include in their care packages. If you know a family in your community with a son or daughter in the military, be sure to ask for their address. By the way, letters to our military only take one stamp to mail overseas. Small children who do not know how to write yet can draw pictures. Often, whoever receives the letter or picture will write back to you. This is a great way to start a penpal relationship! 2. Put together care packages. If you are a savvy couponer, donating items like magazines, food, and toiletries won’t busts your budget, but will be very much appreciated. You can donate these items to organizations like or . Or, you can pick up a flat rate box from your local post office and pack it full of special treats and letters and send it to a soldier you know or . These boxes cost from $10-16 to ship. 3. Encourage the spouses and families left at home. 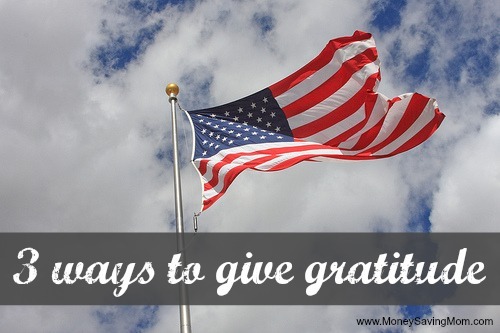 Write a note or email, or drop off a small gift to brighten a military spouse’s day while their loved one is deployed. Separation is hard during deployment and a little bit of encouragement goes a long way! We are so blessed to live in a country where we are free. That freedom has come at a very high cost and the least we can do is show our men and women in uniform that we care and support them, even from thousands of miles away. Katie is a teacher, and Marine wife living in Southern California. She is passionate about working with kids and loves encouraging young women and other military wives. 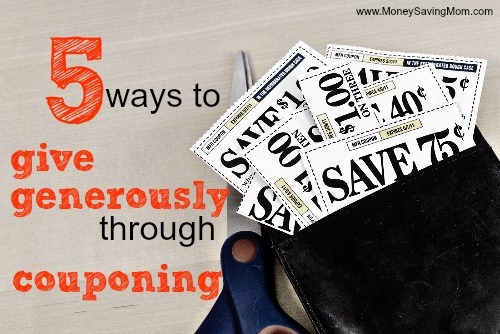 I have been couponing for a little over two years now and it has become a way of life for me and my family. Not only does it save us hundreds of dollars a year on our grocery, drugstore, and clothing budgets, but it has enabled us to give abundantly to people in need on a regular basis! The relative ease in acquiring free products through couponing, playing the “drugstore game,” taking advantage of daily deal sites, and signing up for freebies quickly replenishes my stockpile each month. Therefore, I have become more creative and proficient in how I use these freebies to bless others in times of natural disaster or personal crisis. Natural disasters are a continuous reality in our fallen world. Monetary donations are always very helpful during these disasters, but personally, I have been able to give more (and more frequently) through donating actual needed items from my stockpile. After a natural disaster, I research online for organizations accepting items and try to specifically donate what they are asking for. Usually, these items include nonperishable food, diapers and other baby products, feminine care products, toiletries, and new clothing. I usually have an adequate supply of these items from my couponing and can quickly pack and send a box to these disaster areas throughout our country. Operation Christmas Child is one of my favorite ministries. I love the impact of this ministry on children all over the world, and personally know adults who received a life-changing shoe box as a child. It’s rather easy to fill a shoe box with quality items I can get for free or nearly free by couponing. These include toothbrushes and toothpaste, toys, socks, hats, school supplies, hard candy, and much more. I often try to fill 10 shoe boxes for $10 total! I have already succeeded in this goal and I’m currently working on my eleventh box. For a thorough list of items that can be included in an OCC shoe box, please see these gift ideas. Voice of the Martyrs sends “” to families of martyrs who are struggling in restricted nations such as Pakistan, Iraq, and the Sudan. They have a specific list of items needed for each country which includes pens, bar soap, blankets, towels, writing pads, flip flops, colored pencils, and more. For more information on how to send an Action Pack, visit the . A Blessing Bag is an easy way to help a homeless person when you drive by them at a busy intersection. Simply put essential items in a gallon Ziploc bag and keep your Blessing Bag in your car. The next time you see a homeless person asking for help, you will already be prepared to bless them. Potential items to include can be: Chapstick, small packages of tissues, toothbrushes and toothpaste, mouthwash, combs, bar soap, snacks, socks, a note of encouragement, and a list of community resources. Due to my husband’s allergies, we don’t own a pet, but I can still accumulate free pet supplies every few months. Since I don’t need these freebies, I send them to Humane Societies in natural disaster locations. Every little bit helps when shelters become overloaded from displaced pets. These are just some of the ways I have found to bless people out of the abundance I have through frugal shopping. So next time you sign up for freebies or get free items at the store through couponing, take a second look at these items and see if you can donate them instead. I’m a stay at home mom and our family lives on one income, but I still have enough margin to give when I can get many items for free on a weekly basis! Kelly is a wife and stay at home mom to a very active one year old. 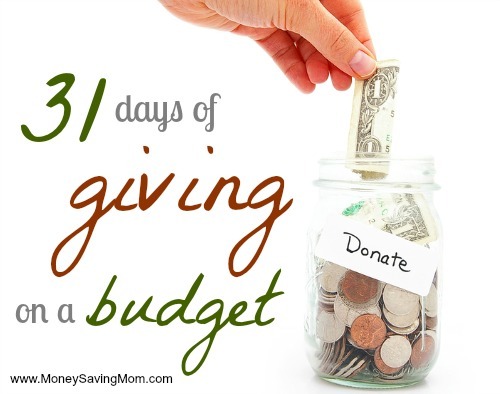 Her blog, , is focused on frugal living to allow for more generous giving to people in need. She is an avid supporter of Operation Christmas Child, Voice of the Martyrs, and Gospel for Asia, and she supplies Disaster Relief Boxes to areas in the U.S. that have been struck by natural disasters using items she has gotten for free.